(FT.com) Five broker-dealers accused of conspiring with Tom Hayes to manipulate the Libor benchmark have been found not guilty in a London court, in a major setback for the UK’s Serious Fraud Office. The brokers – Danny Wilkinson and Colin Goodman from ICAP, Noel Cryan from Tullett Prebon and RP Martin’s Jim Gilmour and Terry Farr – stood trial at London’s Southwark Crown Court for about 15 weeks in the SFO’s prosecution over alleged efforts at Libor manipulation. The jury is still considering one count against Darrell Read from ICAP. Mr Hayes was found guilty of rigging Libor last August, and sentenced to 14 years in prison, though that sentence was later reduced. Prosecutors alleged the men acted as go-betweens by passing along requests between traders for what number the rate should be set at on a given day. The SFO also alleged that Mr Goodman, in his daily emails, would suggest where he thought Libor would be set that day, and would alter the figure to appease Mr Hayes’s requests. The prosecution also alleged that the brokers, with nicknames such as “Big Nose,” “Lord Libor” and “Sarge,” were rewarded by Mr Hayes, one of their biggest clients because of the volume of trading he conducted, with extra commission for their help. (InvestmentNews.com)-Google “New York wealth adviser” and David Edwards’ Heron Financial Group is one of the first firms to pop up, due in part to his early and dedicated approach to social media. The advisory firm founder posts market commentaries, photos from conferences and other information on Facebook, LinkedIn, Twitter and the firm’s YouTube channel. Many of the posts are linked between the platforms and lead visitors back to the firm’s website. “The breadth of information from us and about us on social media enables someone to go from curious to prospect to client in a short time frame,” said Mr. Edwards, who founded Heron Financial Group in 1993. Advisers shouldn’t be afraid to jump on social media and see what works, he said. Through trial and error, advisers can evaluate which of the sites their clients and prospects are on and what topics garner the most interest, or “clicks.” Mr. Edwards directly asks for feedback about what followers do or do not like. He found publishing on WordPress to be fruitless, and believes not enough of his clients or prospects use Google Plus to invest the time in figuring that one out. On the sites Mr. Edwards does frequent, he has found that posts with photos of people, such as smiling clients at a polo match or sailing on Mr. Edwards’ sailboat, generate a lot of attention. 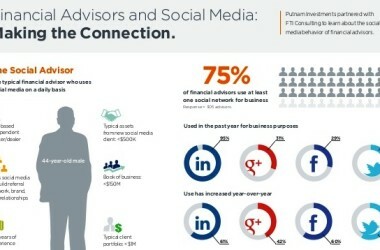 Though social media is not expensive, advisers have to recognize it requires a time commitment. Mr. Edwards said he spends about an hour a day writing for and interacting through social media. It was an even bigger time-commitment just starting out. Heron Financial Group‘s social media focus has helped position Mr. Edwards as an expert on particular issues, and has generated media attention for the firm, which saw its assets under management grow about 20% last year, to $205 million. The direct results of a social media strategy can’t be evaluated in a traditional return-on-investment sort of way, but consider this: Even if a post doesn’t directly cause a client to walk through an adviser’s door, few clients will bother to come to an adviser before first checking them out online. Who knows which commentary or smiling client photo will get them to pick up the phone. • Hire a consultant to help develop a social media strategy and evaluate how well the platforms are working for your firm. • Never write something on social media that you wouldn’t want to see in the Wall Street Journal. • Make sure any communication through a social media network is archived, as required by the Securities and Exchange Commission and the Financial Industry Regulatory Authority Inc.
• Advisers must stay within the compliance guidelines of their firm and regulators, including rules against touting a specific product or investment, or posting performance data. (MarketsMuse.com)-Announced after the close of trading on Thursday, Goldman Sachs (NYSE:GS) made a $5.1 billion settlement with the U.S. Department of Justice, AGs from NY and IL and two other federal agencies in connection with the big bank’s underwriting and sale of mortgage-backed securities (MBS) sounds whopping, but seemed to have little impact on the Squid’s stock price in after-hours trading ..Below extract courtesy of CNBC.. The bank said in a Thursday release that its agreement in principle will resolve actual and potential claims from the Department of Justice, the New York and Illinois Attorneys General, the National Credit Union Administration and the Federal Home Loan Banks of Chicago and Seattle. 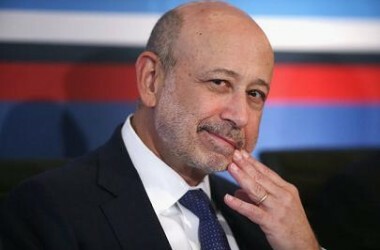 The terms of the agreement say that Goldman will pay a $2.385 billion penalty, make $875 million in cash payments and provide $1.8 billion in consumer relief. The bank said that the relief will be partly composed of principal forgiveness for underwater homeowners and distressed borrowers. 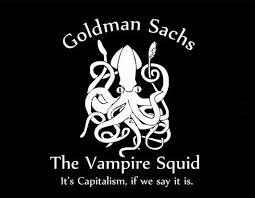 Goldman will also contribute to construction financing, affordable housing, and debt restructuring support. Shares of the Squid traded slightly negative in after-hours action. The agreement in principle is still subject to final negotiation of the documentation, the bank said. 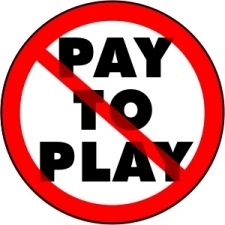 In what some might construe as being a “pay-to-keep-playing settlement” between the US Securities and Exchange Commission and State Street, the global brokerdealer and bank, a division of State Street has agreed to pay the SEC $12million to let bygones be bygones and resolve a long-standing case involving Ohio pension funds..
Law360, New York (January 14, 2016, 2:06 PM ET) — The U.S. Securities and Exchange Commission on Thursday said a State Street Corp. unit has agreed to pay $12 million to settle allegations that it took part in a pay-to-play scheme to win servicing contracts for Ohio pension funds, while a Nelson Mullins Riley & Scarborough LLP partner is facing accusations of facilitating the purported scheme. (TradersMagazine) BrokersDealers, get ready for your culture check close-up. As FINRA examiners make their rounds this year, they will put firms’ culture under the microscope. Wall Street’s chief regulator is turning its attention to the tone set by senior leaders and supervisors, asking whether the culture they create supports compliance, risk management and ethical conduct throughout the brokerdealer organization. The industry regulator last week published its annual letter outlining its examination priorities for the new year, putting the industry on notice that, along with firm culture, FINRA examiners will be looking broadly at issues around supervision and liquidity, as well as a host of other areas ranging from cybersecurity to how brokers work with elderly clients. In a statement accompanying the exam-priorities letter, FINRA CEO Richard Ketchum explains that the focus on culture comes in response to the failure of too many firms to establish a compliance-driven ethos that rejects self-dealing and where brokers and advisors consistently place clients’ interests ahead of their own. While FINRA says that it plans to “formalize” its method for assessing a firm’s culture in 2016, the industry regulator insists that it is not going to be overly prescriptive and hold brokers to a one-size-fits-all standard for what an appropriate culture should look like. “Our goal is not to dictate a specific culture, but rather to understand how each firm’s culture affects compliance and risk management practices,” Ketchum says. At the same time, FINRA is working toward a more objective set of criteria to evaluate the culture of a firm, and says that it will complete the review of incentives and conflicts of interest in the retail brokerage sector that it began late last year. Through those sweep exams, FINRA has been collecting information on how firms navigate conflicts of interest in areas like proprietary products and the compensation structure for registered reps.
FINRA explains that it expects firms to take “visible actions” to mitigate conflicts of interest and promote the clients’ interests, and to adopt a zero-tolerance policy for violations of the organization’s protocols. Additionally, FINRA intends to focus on the four areas where it has observed firms falling down in their supervisory procedures: Conflicts of interest, Technology, Outsourcing, and Anti-money laundering programs. Cybersecurity will be a chief focus as examiners review firms’ technology operations. Officials at FINRA and the SEC have been warning the industry to sharpen its focus on protecting information systems and client data in the face of constantly evolving and widely varied cyber threats. “While many firms have improved their cybersecurity defenses, others have not — or their enhancements have been inadequate,” FINRA cautions in its letter. This article originally appeared on the website of Traders’ sibling publication Financial Planning.